". . . Observations in December 1972 indicated three main areas of steaming ground in which temperatures as high as 59°C were recorded at depths of 0.25 m. Numerous fumarolic ice towers were scattered throughout the summit area (Lyon and Giggenbach, 1974). Two members of the U.S. Antarctic Research Program climbed the mountain in January 1983. No change was noted in the number, size, and distribution of ice towers and steaming ground from the 1972 reports. Measured ground temperature temperatures were also similar to those in 1972. There was no evidence of any change in the activity over the last 10 years." Further Reference. Keys, J.R., McIntosh, W.C., and Kyle, P.R., 1983, Volcanic activity of Mount Melbourne, North Victoria Land: Antarctic Journal of the United States, 1983 review, v. 18, no. 5, p. 10-11. Information Contacts: P. Kyle, New Mexico Inst. of Mining and Tech. The Global Volcanism Program has no Weekly Reports available for Melbourne. Mount Melbourne is a large undissected stratovolcano along the western coast of the Ross Sea in Antarctica's northern Victoria Land. The 2732-m-high glacier-clad edifice lies at the center of a volcanic field containing both subglacial and subaerial vents along a dominantly N-S trend. A large number of scoria cones, lava domes, viscous lava flows, and lava fields are exposed at the summit and upper flanks. A number of very young-looking cones are located at the summit and on the flanks. Tephra layers are found within and on top of ice layers, and the most recent eruption was estimated to have occurred between 1862 and 1922. The volcano displays fumarolic activity that is concentrated along a NNE-SSW line cutting through the summit area and along a line of phreatomagmatic craters on the southern rim of the summit crater. Prominent ice towers and pinnacles were formed from steam condensation around fumarolic vents. Keys J R, McIntosh W C, Kyle P R, 1983. Volcanic activity of Mount Melbourne, Northern Victoria Land. Antarctic J U S, 18: 10-11. Lyon G, 1986. Stable isotope stratigraphy of ice cores and the age of the last eruption at Mt. Melbourne, Antarctica. New Zeal J Geol Geophys, 29: 135-138. Lyon G L, Giggenbach W F, 1974. Geothermal activity in Victoria Land, Antarctica. New Zeal J Geol Geophys, 17: 511-521. There is no Deformation History data available for Melbourne. There is no Emissions History data available for Melbourne. Mount Melbourne towers above the ice shelf of the Ross Sea in Antarctica's northern Victoria Land. 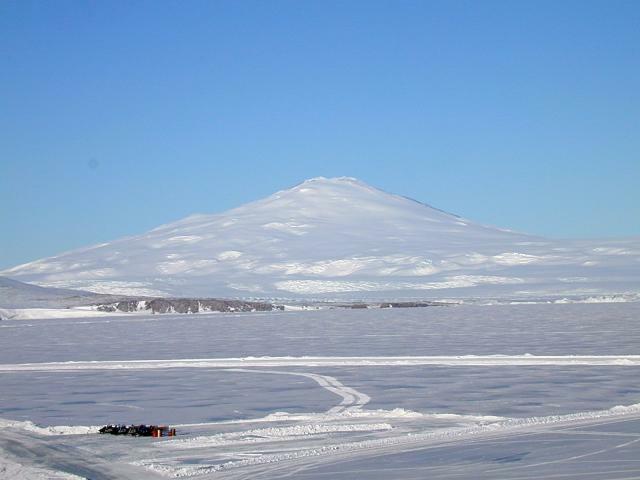 The 2732-m-high glacier-clad stratovolcano has a large number of scoria cones, lava domes, and viscous lava flows. Lava fields are exposed at the summit and upper flanks. A number of very young-looking cones are located at the summit and on the flanks. The volcano displays fumarolic activity, and tephra layers are found within and on top of ice layers. The most recent eruption may have been only a few hundred years ago. Photo by Arrigo Caserta, 2000 (Istituto Nazionale di Geofisica e Vulcanologia, Roma). The Global Volcanism Program has no maps available for Melbourne. There are no samples for Melbourne in the Smithsonian's NMNH Department of Mineral Sciences Rock and Ore collection. Large Eruptions of Melbourne Information about large Quaternary eruptions (VEI >= 4) is cataloged in the Large Magnitude Explosive Volcanic Eruptions (LaMEVE) database of the Volcano Global Risk Identification and Analysis Project (VOGRIPA).